Saturday October 24 marked my first excursion into the Grand Canyon (and first trip to the Canyon since moving to Arizona over 3 years ago). 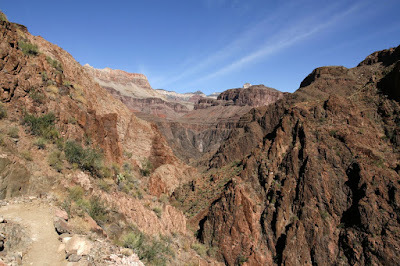 The itinerary for the day was moderately aggressive - a 4 AM wake-up in Tusayon, drive to the Bright Angel Lodge, take a shuttle bus to the South Kaibab trailhead, and hopefully be on the trail before sunrise. 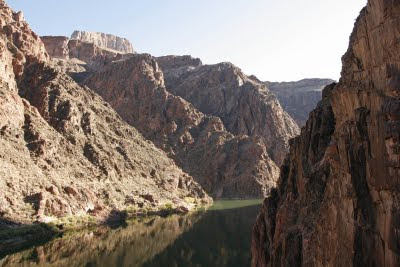 We'd take that trail to the canyon bottom, cross the Colorado River to Phantom Ranch to meet some friends for a short 30-45 minute break, then head back over the river to the Bright Angel trail and back up to the South Rim. Things went pretty much according to plan, though we didn't reach the trailhead until just past 6 AM (about 30 minutes later than we wanted). 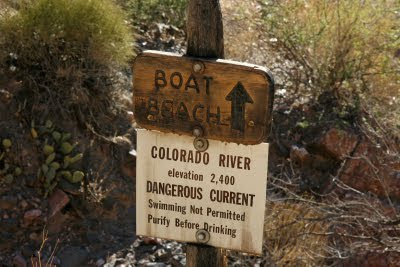 Our party of 4 was entirely out of the canyon by 2:30 PM, with some out by 2 PM. 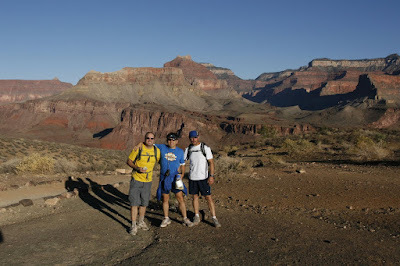 South Kaibab begins on the South Rim at about 7200 feet elevation. The temperature was likely in the upper 20's. 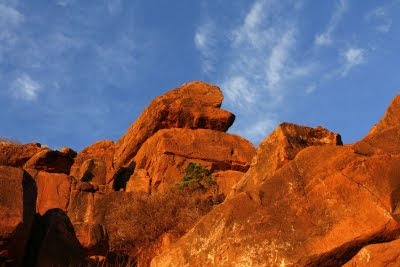 Sunrise occurred about 30 minutes into the hike, and provided for some brilliant red/orange lighting of the already reddish rock. 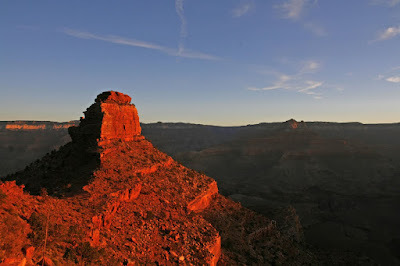 About an hour or two after sunrise, photography in the canyon gets very difficult. The rock faces and bright sun make for very high contrast scenes that cameras just don't handle well without playing some tricks. With no tripod on the hike, I had to rely on handheld shots, which further limits some of the tricks that can be played to improve the dynamic range of the photos. Around 7:30 AM the Colorado River first comes into view. The photo below demonstrates the issues with the high contrast scene. The shadows are too dark and the sunlit areas look bland, and this is after some photoshoping. With a tripod, I could have bracketed my exposures and merged them for a more pleasing view. Maybe next time. 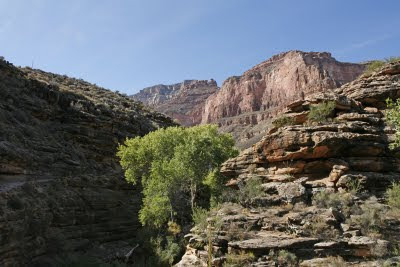 Continuing down the canyon, the vegetation begins to noticeably change. The rim is lined with Ponderosa Pine and some fir trees. Gambels Oak are seen just below the rim (and perhaps even at the rim, though I didn't see any). Shortly there after, pinyon pine and juniper begin to take over. 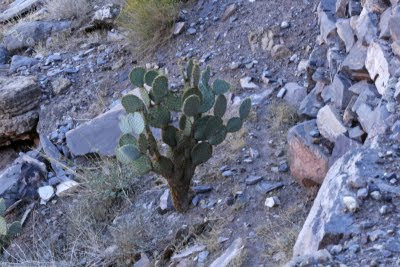 There are some yuccas and cacti on the rim, but these increase in variety and number through the descent. 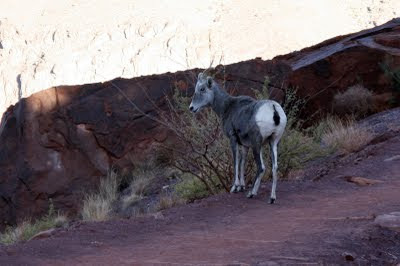 A solitary Desert Bighorn Sheep was seen about 1/2 way down the canyon. 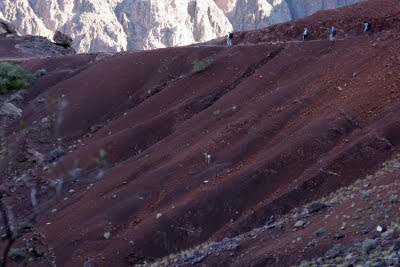 It was first spotted a few hundred yards away - you can see it in the middle of the frame below the trail in this photo. You can click on any of the photos for a larger view. The sheep was heading towards the trail, so we picked up the pace and nearly caught up to it by the time it reached the trail. The sheep had no concern for us, and continued down the trail at a slow pace for a few minutes. 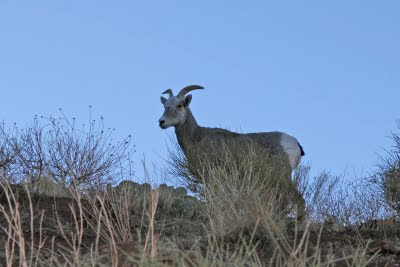 It eventually went above the trail and posed for a couple of pictures. It soon got tired of our gawking and started towards us, making it clear that it had enough and wanted us to move on. 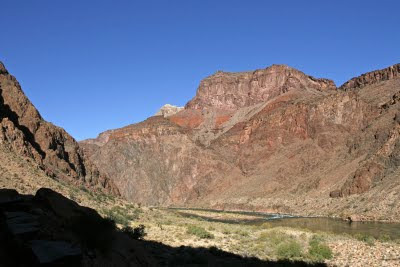 Another great view awaited us, with the Colorado in the foreground and great rock formations in the background. Again, the photo doesn't do the scenes justice due to the contrast. This point marked about 4800 feet of descent. 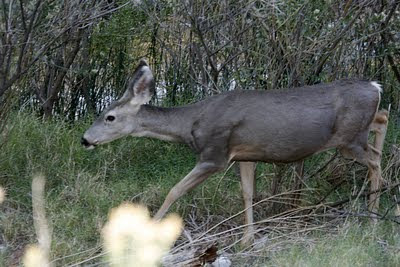 Along the river and tributaries numerous deer were foraging among willows and grass. 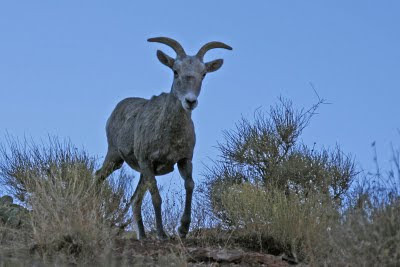 They were extremely tame, used to campers at the nearby Phantom Ranch facility. 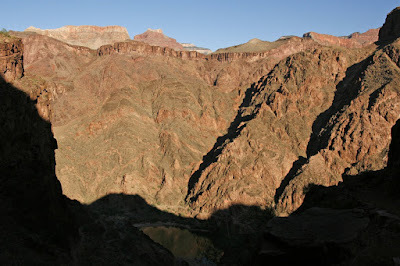 While at the bottom, nearby canyon walls obscure the taller more distant walls. 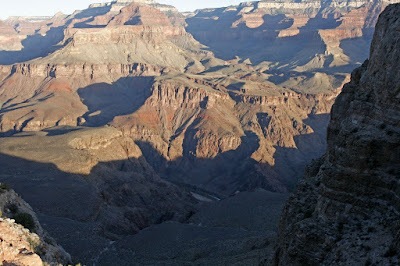 From this vantage point you'd have no idea how large of a canyon you were in. 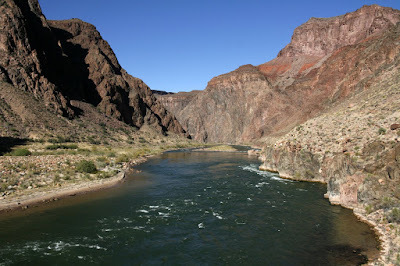 We crossed the river again to connect to the Bright Angel trail. 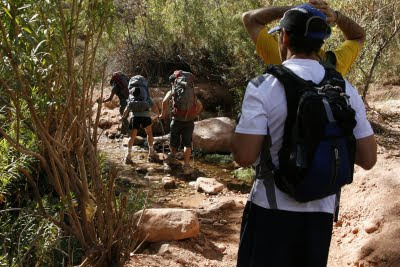 After a steep 15-20 minute ascent, hikers get a view of just how much higher they have to go. The first 60-90 minutes of Bright Angel has 3 or 4 stream crossings. The trail runs parallel to a stream for awhile, providing a nice winding line of Fremont Cottonwood trees and a cooling effect. 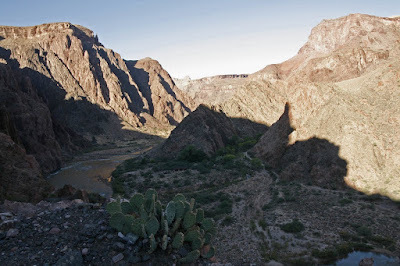 Temperatures at the canyon bottom can be 25-35 degrees warmer than the south rim, and 40 or more warmer than the north rim. 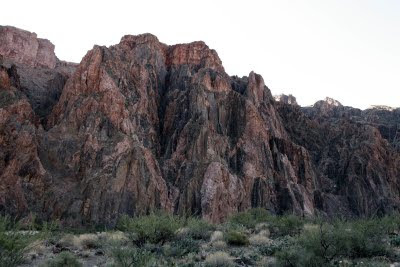 Bright Angel doesn't provide many great photographic opportunities as you reach the middle and upper elevations. 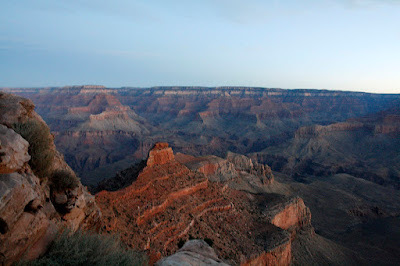 I skipped the few that did occur as my focus turned to maintaining a pace and getting out of the canyon. I made it around 2:30 PM despite being slowed by a flare up of some knee pain. 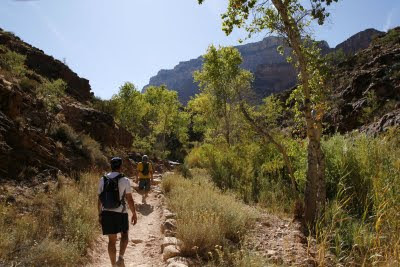 The total length was 18 miles, with 4800 feet of descent, and about 4400 feet on the ascent (Bright Angel trailhead is about 400 feet lower than South Kaibab). Nice pictures and great description! I liked the pics and the narrative. I never knew there was a bridge across the river. Outstanding travelog. Wish I was there too.